The first time I arrived at the Calgary Rowing Club, I was infatuated by the picturesque view of row boats lining the Glenmore Reservoir. The landscape looked eerily similar to my computer background. It was astonishing how I had been unaware of this beautiful place despite living in Calgary my entire life. After admiring the view, I was greeted by a welcoming face and instantly felt like I had been a member of the Rowing Club for years. This is when I met Aline Belzil, the boathouse manager at the Calgary Rowing Club. Aline must have sensed how eager Walter, my fellow Sport Calgary summer student, and I were to get on the water because she immediately told us that new rowers learn the technique in the rowing tank before going out on the water. While I was disappointed we could not start immediately, I was enthusiastic to learn the correct rowing technique. The rowing tank is essentially a boat attached by metal arms to the bottom of a pool. 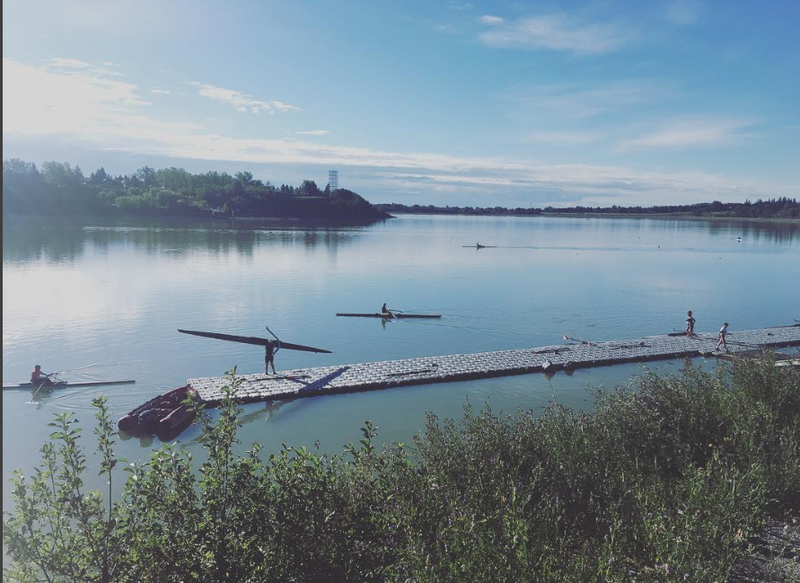 While it might not be as scenic as the Glenmore Reservoir, Aline explained how the rowing tank is a vital training tool in the off-season when athletes are unable to row on the frozen reservoir. In the rowing tank, Aline taught us more about rowing. I learned that the two main forms of rowing are sculling and sweeping. Sculling is done with two oars, and sweeping is done with only one oar. The standard length of an Olympic race is 2000 meters long. To put that into perspective, that is about that same length as ten Calgary Towers. Five seconds into moving my body in a fashion that somewhat resembled rowing, it was clear that I was under the false assumption that rowing only worked out your arms. It only took five minutes for my legs, back, chest and arms to start burning and I could feel the sweat coming off my body. Rowing was one of the best full-body workouts I have ever had. Once we got the hang of the proper technique in the confines of the rowing tank and Aline was confident Walter and I wouldn’t have to be rescued, we were ready to hit the water. 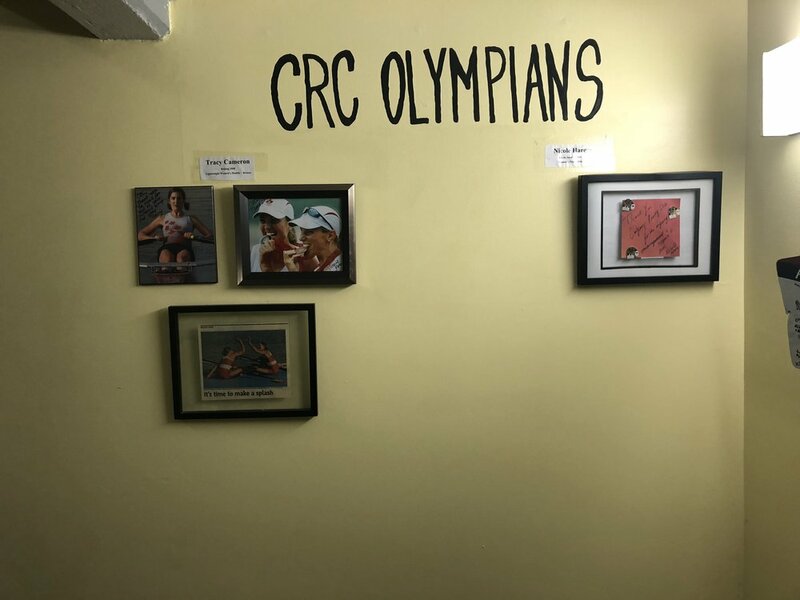 On our way to the boathouse, we passed a wall of plaques with the names and pictures of many accomplished rowers that had trained at the Calgary Rowing Club. It was amazing that I had just learnt the basics of rowing in the same tank that many Olympians used to perfect their flawless technique. After learning about the Calgary Rowing Club’s contribution to Canada’s Olympic team, we selected our boat and started heading down to the dock. But just as we stepped foot on the dock, there was a bright flash and a loud crack of thunder. Aline told us that we couldn’t go on the water until the lightning stopped, and the forecast was not looking good. I didn’t get to test my rowing skills that day, but I wasn’t ready to give up on my Olympic dream. Walter and I returned the following week, determined to finally conquer the Glenmore Reservoir. This time, we were greeted by bright and sunny weather that was perfect for rowing. Having already practised in the rowing tank, we immediately got our equipment and walked to the dock. The moment I got into the boat and let go of the dock I felt unstable. Olympic rowers make it look so easy on YouTube. Once I balanced myself out and took a couple mini strokes I felt comfortable trying a full stroke. Turns out, I was not ready. The boat leaned to one side when I pulled the oar back too much and the handle got caught on my shirt. Luckily, I was able to balance and avoid falling in. Then, catastrophe struck; I looked over and Walter’s boat was upside down and he was fully submerged in the water. Judging from the smile on Walter's face, falling in looked fun and refreshing on such a hot day. While we were not prepared to get wet, Walter was resilient and got back in the boat and continued to row. As I rowed back, I got time to reflect on what makes the Calgary Rowing Club special. The Calgary Rowing Club is like a member of a rowing team, perfectly in-sync with the community and helping sport in Calgary gain momentum. Whether you are looking for a recreational sport to improve your health, want to be a part of a supportive and active community or foster your competitive nature, I would recommend the Calgary Rowing Club to everyone. Rowing is great way to get in shape, feel at ease and meet wonderful people. The Calgary Rowing Club offers rowing and para-rowing programs for old and young regardless of fitness level. Recreational programs are available that focus on fun and fitness, while other junior and adult programs develop high performance athletes. To register or learn more, click here or email.